The TTS study area now encompasses most of the Central Ontario Zone. A notable exception is Kitchener-Waterloo, which participated in the 1996 TTS but elected not to take part in the most recent 2001 survey. This is an unfortunate development, since it means that current travel patterns and trends for Kitchener-Waterloo (both internally within the region and to and from the rest of the Central Ontario Zone) are not available. In order to present a consistent set of data on current (2001) travel patterns and recent trends (1996-2001) in travel behaviour within the Central Ontario Zone, the study area for this paper is therefore the "reduced COZ" for which TTS data are available for both 1996 and 2001. Thus, both Kitchener-Waterloo and the portion of Simcoe County that was not included in the 1996 TTS are excluded from the analysis. 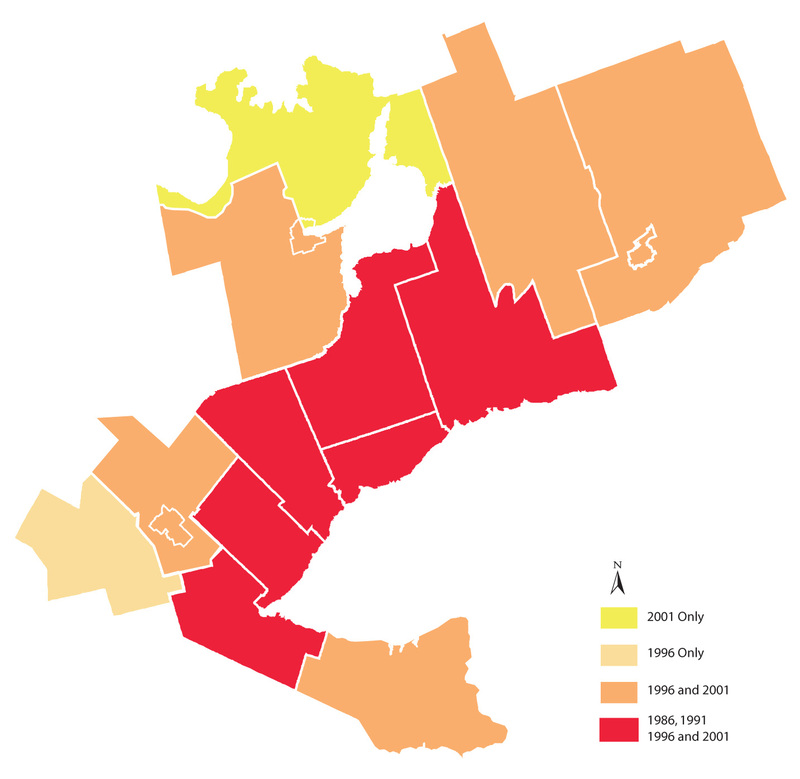 Despite these exclusions, the study area is representative of travel behaviour and trends within the Central Ontario Zone as a whole, and serves as a good base for investigating the relationship between urban form and travel behaviour. In order to keep the terminology as simple as possible, this reduced COZ TTS-based study area will simply be referred to as the Central Ontario Zone or COZ whenever TTS data are presented. Before 1996, the TTS study area consisted of the GTA (Toronto, Durham, York, Peel, and Halton) and what is now the amalgamated City of Hamilton (formerly the Region of Hamilton-Wentworth). Some of the analysis in this paper is based on data derived from these earlier surveys and so is restricted to this smaller region, which will be referred to as GTA+H in this paper. Again, although this area obviously excludes a considerable portion of the Central Ontario Zone, it still provides useful information, particularly given that much of the growth in the Central Ontario Zone has been (and continues to be) located within this region. 2. Documentation on the TTS surveys and datasets is available from the Joint Program in Transportation, University of Toronto web site: www.jpint.utoronto.ca.